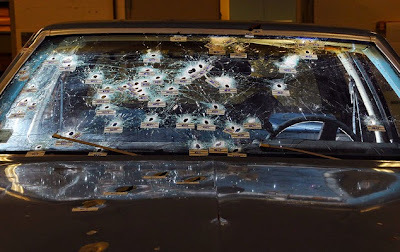 Cleveland is the new Ferguson....or Baltimore...or........(fill in the blank). In reality, one our incidents of cops vs. the African American public pre-dates Ferguson or Baltimore, though I'm not bragging by saying "hey, we were first!". This is not a contest one wants to be winning. And we were hardly first. There have been multiple cities with police and unarmed minority victims over the years. A high speed car chase through multiple cities, involving dozens of officers, shooting (137 times) and killing two unarmed African American folks. One victim had 24 wounds. One had 23. That only makes 90 shots that went..........somewhere other than intended. Clearly, a few into the windshield. .....but many of them came from the officer on trial, who was standing on the hood of the victim's car, shooting directly into it. That officer was just acquitted of all charges yesterday. While there is much to school the police in terms of process and procedure, somewhere on that 'to-do' list needs to be more time at the firing range. Yes, the incident was tragic. Yes, there was clearly excess in terms of the number of police involved. Yes, police commanders on down completely ignored their own protocols in terms of pursuit and deadly use of force. Forgiving the pun, it was overkill. Cleveland police, investigated by the U.S. Department of Justice and given a horrible report on their behaviour, has so far poo-poo'd their findings - which doesn't surprise me. But this car chase and two other cases pending - all eyes are on Cleveland and their court system. Not only was no other officer charged in the incident, all - or at least most - who were called as witnesses refused to testify, or pleaded the Fifth. A big blue wall of silence. The police kind of fucked up a few big cases: you know, three kidnapped girls sitting right under their noses for a decade. Then there was the 11 women who were killed and buried in a back yard - but you know, they were minorities, drug addicts and / or prostitutes, so the police didn't really look for them. Still, the acquittal comes on the heels of other cops being let off the hook for similar behaviour. But in a way, I knew he would be - with one question from his defense to a witness: yes, the officer's behaviour was against procedure. When followed up with - 'was it against the law? ', the answer was 'no'. ....and that was in the second week of the trial. At least as of this drafting, no one has burned the city to the ground. No one has looted. There have been peaceful protests - mostly marching or blocking of traffic. Truthfully, I believe the local new outlets are disappointed. For weeks up to the verdict, they kept asking (hoping!) this would be the next Baltimore. Lordy, they wanted some action to report on - it was almost like they were baiting the public to do something.....anything. I'd say these police actions with no legal repercussions cannot continue. But they might. And at some point there will be a breaking point, and it won't be pretty. My fear is that even innocent law enforcement will be convicted in the attempt to appease a broken system and the fear of reprisal. Trust in the system has evaporated. "I'd say these police actions with no legal repercussions cannot continue. But they might. And at some point there will be a breaking point, and it won't be pretty." yep; it's gonna happen; could be my city, could be your city, could be anywhere, but it's gonna happen. cops been getting away with murder too long. We are amazingly short-sighted in this country about so many things. You don't have to be Karma to know what will happen. I hate that all cops are now being painted with that Murdering Racist Brush. Not all cops shoot first and ask questions later. Not all cops murder young black men in the streets. Not all cops choke the life out of Americans. But a few bad apples, spread alla cross the country, certainly make it seem that way. When officers refuse to testify about crimes other officers commit – can they really be considered “innocent”? Even if its their work culture, they almost all end up looking guilty. If the good ones cant defend us from the "bad apples" they are not good ones.